Racial/ethnic minorities are often assumed to be less willing to participate in and provide biospecimens for biomedical research. We examined racial/ethnic differences in enrollment of women with breast cancer (probands) and their first-degree relatives in the Northern California site of the Breast Cancer Family Registry from 1996 to 2011. We evaluated participation in several study components, including biospecimen collection, for probands and relatives by race/ethnicity, cancer history, and other factors. Of 4,780 eligible probands, 76% enrolled in the family registry by completing the family history and risk factor questionnaires and 68% also provided a blood or mouthwash sample. Enrollment was highest (81%) for non-Hispanic whites (NHWs) and intermediate (73–76%) for Hispanics, African Americans, and all Asian American subgroups, except Filipina women (66%). Of 4,279 eligible relatives, 77% enrolled in the family registry, and 65% also provided a biospecimen sample. Enrollment was highest for NHWs (87%) and lowest for Chinese (68%) and Filipinas (67%). Among those enrolled, biospecimen collection rates were similar for NHW, Hispanic, and African American women, both for probands (92–95%) and relatives (82–87%), but lower for some Asian–American subgroups (probands: 72–88%; relatives: 71–88%), foreign-born Asian Americans, and probands those who were more recent immigrants or had low English language proficiency. These results show that racial/ethnic minority populations are willing to provide biospecimen samples for research, although some Asian American subgroups in particular may need more directed recruitment methods. To address long-standing and well-documented cancer health disparities, minority populations need equal opportunities to contribute to biomedical research. The online version of this article ( https://doi.org/10.1007/s10552-019-01154-6) contains supplementary material, which is available to authorized users. We thank the study coordinators, data managers, analysts, interviewers, and phlebotomists who supported the family registry study, including Enid Satariano, Connie Cady, and Judy Goldstein. We are grateful to the families who continue to participate in the family registry study. EMJ acquired the data, conceived of and designed the analysis, interpreted the data, and drafted and revised the manuscript. MS contributed to the literature review and the writing. JK and MS performed data management and the statistical analysis, interpreted the data, and participated in the revision of the manuscript. ASW and DWW acquired the data, interpreted the data, and participated in the revision of the manuscript. All authors approved the final manuscript. This work was supported by the National Cancer Institute at the National Institutes of Health (Grant UM1 CA164920). The content of this manuscript does not necessarily reflect the views or policies of the National Cancer Institute or any of the collaborating centers in the Breast Cancer Family Registry, nor does mention of trade names, commercial products, or organizations imply endorsement by the U.S. Government or the Breast Cancer Family Registry. The collection of cancer incidence data used in these studies was supported by the California Department of Public Health as part of the statewide cancer reporting program mandated by California Health and Safety Code Sect. 103885; the National Cancer Institute’s Surveillance, Epidemiology, and End Results Program under contract HHSN261201000036C awarded to the Cancer Prevention Institute of California; and the Centers for Disease Control and Prevention’s National Program of Cancer Registries, under agreement #1U58 DP000807-01 awarded to the Public Health Institute. 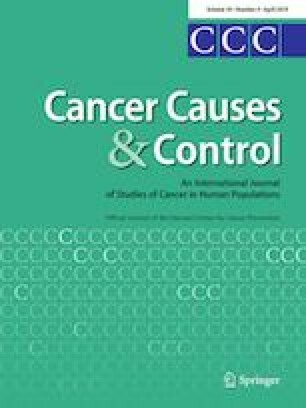 All procedures performed in this study involving human participants were in accordance with the ethical standards of the Institutional Review Board at the Cancer Prevention Institute of California and with the 1964 Helsinki Declaration and its later amendments or comparable ethical standards.